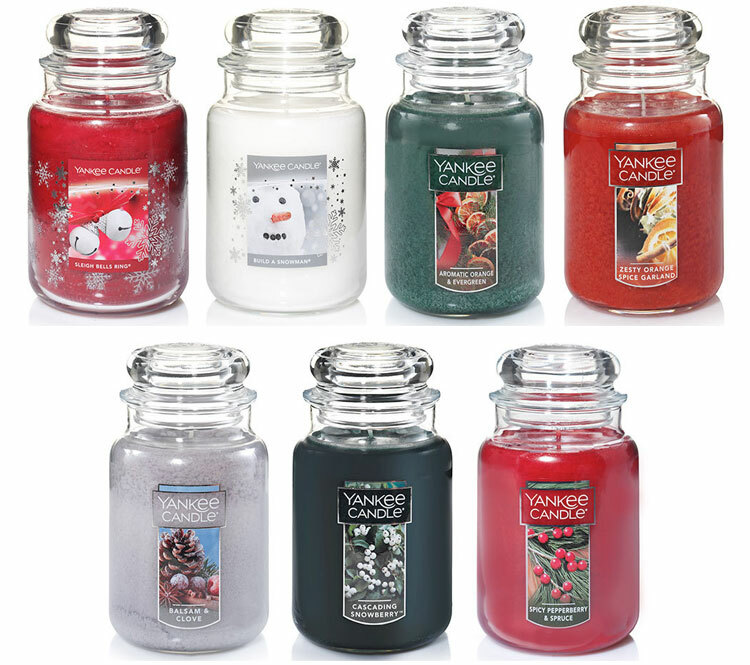 Christmas Candle Fragrances by Yankee Candle - A new collection of festive candle fragrances. These seven holiday home fragrance scents include Aromatic Orange Evergreen (orange, evergreen, cinnamon, cedarwood), Balsam & Clove (clove, balsam, pine, amber), Build A Snowman (vanilla, cedar, pepper, citrus), Cascading Snowberry (mint, eucalyptus, snowberry, cypress), Sleigh Bells Ring (cinnamon, clove, spices, vanilla), Spicy Pepperberry & Spruce (cinnamon, clove, pine, spruce), and Zesty Orange Spice Garland (orange, spices). Available now in classic jar candles, tumbler candles, tea lights, and votive candles. A new twist for the holidays, effervescent orange takes evergreen to someplace unexpected and fresh. Clove, and a pinch of cinnamon, make the clean scent of balsam altogether new. A cool, crisp scent of wintry snowberries and evergreens dusted with frost. The tree is set for the holidays and your home is filled with favorite scents of cinnamon stick, clove, vanilla and winter berry…perfect! A scent as holiday perfect as a snowman in the meadow - cool with vanilla and cedar, finished with a dash of pepper and citrus. Everything a holiday welcome should be - full of cinnamon, clove and warm baking spices with a hint of sweet vanilla. Holiday spices infused with energetic orange to make a fun, new expression of the season. Walmart - Introducing FREE 2-Day Shipping at Walmart.com!